As part of the NSW Transport Hack Day, I got together with a couple friends to work on a transport app. The idea was to utilise context awareness (knowledge of delays and a users history, time, and location) to predict and surface the most appropriate route that a user may want to take - without them tapping on any buttons. However, the user interface would also have to offer alternative routes in a straightforward manner if the app’s first prediction is incorrect. The final output was a mix of a mockup and technical implementation. 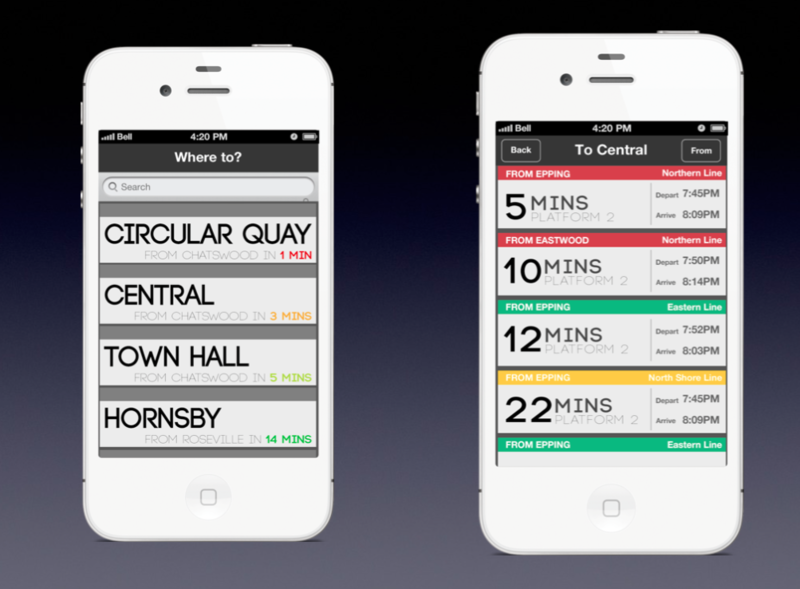 The mockup was done with a mix of XCode and Photoshop to ensure it stayed true to a native app, whilst the technical implementation focused on Train data and dummy user data. In future work, it’d be great if both the designed prototype and technical implementation were better integrated in the end - to do this, they would have to be better integrated throughout the workflow. Perhaps context-aware functions are better implemented in later stages of development as the effort in implementing them often go unseen. Update: Looking a few months forward, Google Now serves the same functionality - however, this was still a great excercise.